Hello and welcome to the 552nd installment of the SWD. Within the scope of the second phase of the Resistance of the Age in occupied Afrin, our forces continue to carry out operations against the Turkish invasion army and its mercenary allies. On September 18th, one of our units targeted a military point of the Ahrar al-Sharqiya mercenary fraction, located between the villages of Kafr Nabu and Berade of Afrin’s Sherawa district. Clashes at close range broke out between our unit and the mercenaries. As a result, two mercenaries were killed and three wounded. Free Syrian Army’s Ahrar al-Sharqiya arrested an Islamic State’s cell near Shamarin camp, as the cell’s elements crossed Aoun al-Dadat checkpoint on their way towards Turkey. The cell consisted of five elements, including a commander. Unknown gunmen wounded two individuals affiliated with Hayat Tahrir al-Sham in the city of Sarmin. The two individuals are not directly part of Hayat Tahrir al-Sham, but have collaborated with the group in the past during the battles for Sarmin. Our forces continue their military operations on various fronts , making further progress, while Daesh is calling for a clear repression in his ranks . 1 – Hajin axis: Our forces clashed with elements of Daesh at night , following an attack by the latter on one of the points of our fighters, and resulted in the clashes killed 3 terrorists. One of our fighters was injured in the clashes and was taken to the hospital. Two others were injured as a result of a mine explosion. Our forces advanced 750 meters this morning and were able to install 6 new points. Our forces immediately began combing a number of houses, during which a mine exploded 3 of our fighters wounded. 2 – Al-Shadadi axis: Violent clashes broke out between our fighters and terrorists, which resulted in the capture of our fighters a quantity of military equipment. The International Alliance aircraft also carried out air strikes against a number of terrorist organization sites. Our forces made progress at 6 pm on this axis, and strong clashes broke out between them and elements of the terrorist organization, in which 13 new points were installed and one terrorist was killed. Coalition aircraft also carried out strikes against the terrorist organization’s positions, killing 3 terrorists. 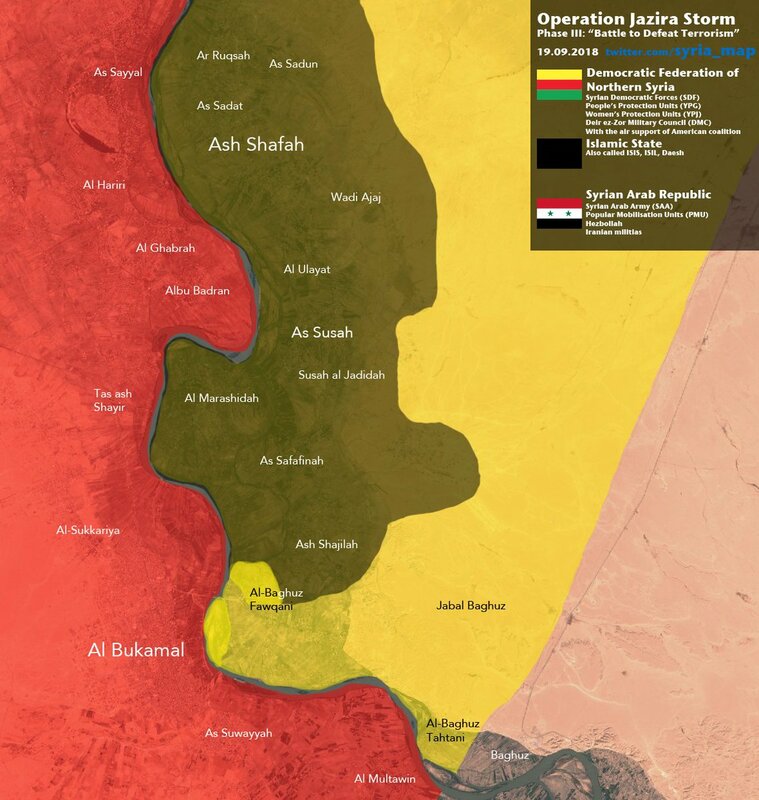 3 – Al-Kasra axis: Our forces combed the northeastern part of the village in full, during which sporadic clashes broke out between our fighters and members of the terrorist organization, and the explosion of a landmine 3 of our fighters resulted in injuries, in addition to our fighters were able to fix one point. 4 – Al-Bagouz: Violent clashes broke out between our forces and the terrorist organization this morning. The mercenaries tried to launch a counter-attack using two car bombs, but our fighters resisted the attack and destroyed the cars before they reached their target. The clashes continue until the moment of preparation. – Number of mines that exploded: 2 / mines. – Points installed: 20 points. – Number of martyrs among our fighters: 5 martyrs. – Number of injured fighters: 9 wounded. Islamic Emirate of Afghanistan’s (Taliban) sniper killed an element of the Afghan Local Police in Dawlat Abad district. Afghan National Security Forces killed six elements of the Islamic Emirate of Afghanistan, as well as seized several weapons depots and ammunition caches in Chaki Wardak district. Islamic Emirate of Afghanistan overran an Afghan National Army’s post in Ghor Ghori area of Shib Koh district. At least three elements of the Afghan National Army were killed, while an element of the Islamic Emirate of Afghanistan was wounded in the encounter. Islamic Emirate of Afghanistan seized an armored vehicle, a PK machine gun, an RPG launcher, six assault rifles, and three motorcycles from the post. Afghan National Security Forces killed ten and wounded three elements of the Islamic Emirate of Afghanistan, as well as destroyed two bases in Khas Urozgan, Deh Rawud, and Tarinkot districts. Islamic Emirate of Afghanistan killed and wounded seven elements of the Afghan National Security Forces in Paie Nawa area of Tarinkot district. Islamic Emirate of Afghanistan’s improvised explosive device destroyed an Afghan National Army’s armored personnel carrier in Khorzani area of Shah-e Safa district. Afghan National Security Forces killed five and wounded eight elements of the Islamic Emirate of Afghanistan in Marjah and Nawa-I-Barakzayi districts. Islamic Emirate of Afghanistan’s improvised explosive device destroyed an Afghan National Army’s armored personnel carrier in Seydano area of Jerashk district. Islamic Emirate of Afghanistan’s snipers killed five elements of the Afghan National Security Forces in Sangin, Nad Ali, and Lashkar Gah districts. Afghan National Security Forces killed three and wounded four elements of the Islamic Emirate of Afghanistan in Maywand district. Islamic Emirate of Afghanistan overran an Afghan National Army’s checkpoint in Shago Godar area of Arghistan district. Three elements of the Afghan National Army were killed and two wounded, including commander Abdul Qadir. Islamic Emirate of Afghanistan seized two armored personnel carriers, a mortar, a PK machine gun, and an RPG launcher from the checkpoint.